A person needs to have money to spend money, and the people who have more money are going to spend more money. Advisors work with investors to turn their money into more money, either for current spending, greater investments or to provide funds for retirement. But investors do not invest all of their money. Some of it they spend. Spectrem’s annual study on asset allocation among affluent investors looks at how investors invest their funds. It examines their current portfolio, their future investment intentions, their retirement packages, their insurance ownership and security products such as wills and trusts. But, included in the asset allocation of Millionaire investors is their normal expenditures on clothing, automobiles, entertainment and vacation. Examining those expenditures is revealing when affluent investors are segmented by age and wealth. The study Asset Allocation, Portfolios and Primary Providers looks at Millionaire investors with a net worth between $1 million and $5 million and Ultra High Net Worth investors with a net worth between $5 million and $25 million. Obviously, investors with greater net worth spend more on everyday expenditures, but sometimes the spending differences are stark and revealing. How does this information assist advisors in their relationships with investors? Any information advisors can gather on the habits of investors related to any use of their money can create a better understanding of the motivations and habits of investors, which in turn can provide better ideas for investment recommendations. There are expenditures in the study that everybody has, and the spending totals are a matter of degree. Everybody buys clothing, most people own cars, and most people do home improvement projects that cost money. What is revealing is the expenditures in areas that reflect greater choice, such as entertainment purchases, vacation spending, charitable and political contributions, and collectible ownership. 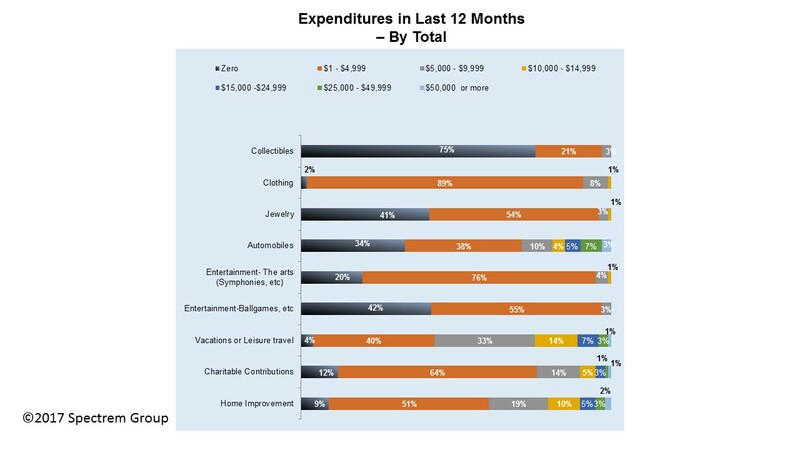 The Spectrem study asked investors to list their expenditures over the 12 months prior to taking the survey, and there is much higher spending on collectibles, vacations and based on age. For instance, millennial Millionaires spend much more on tickets to symphonies, plays and concerts than do older investors. Seventeen percent of millennial Millionaires spent at least $5,000 on tickets for that form of entertainment in the previous 12 months, while only 4 percent of Baby Boomers did so. The same is true for sporting events, with 21 percent of millennial Millionaires spending at least $5,000 while only 7 percent of Gen Xers did so. On the other hand, the older an affluent investor is, the more they spend on vacations. Sixty percent of World War II Millionaires spend at least $5,000 a year on vacations while only 21 percent of millennial Millionaires do so. Even among Baby Boomers, 57 percent spend at least $5,000 annually on vacations. The older the investor, the more likely they are to make charitable contributions. Only 13 percent of millennial Millionaires contributed $5,000 or more in the year prior to taking the survey, while 18 percent of Gen Xers, 23 percent of Baby Boomers and 32 percent of World War II investors did so. Is that sort of spending just throwing money away? In each case, the investor does get something in return in terms of entertainment, relaxation or self-respect (in the case of charitable contributions). But there are expenditures that do have some value if done properly, such as collectibles. Among Millionaires, only 25 percent spent any money on collectibles, and only 4 percent spent more than $5,000 on such purchases. Among UHNW investors, 33 percent made collectibles purchases, including 10 percent that spent more than $5,000 and 5 percent that spent more than $10,000. Certainly, investors invest in order to secure their financial future, or the financial future of their offspring. But they also like to have money to spend on personal pleasure, and advisors can help in that regard as well. Advisory firms that offer concierge services can provide incentive deals for travel, and can be aware of events which support charitable causes or the arts. While the business of providing financial advice concentrates on investment opportunities, an advisor can improve his relationship with his clients by considering their outside interests and providing information or guidance in how best to spend those funds.